OKAY. . . So, see the picture above? That is what the post I just sent is supposed to look like. I copied html from the Goodreads site and it looked good to me – and on my blog. However, I learned that it looks like gibberish in email. Sorry about that. If you want to follow the link, you’ll have to visit my website. 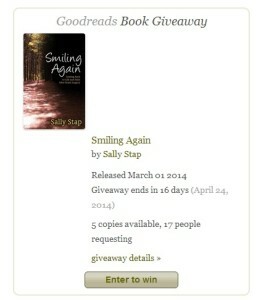 Or look up Giveaways on the Goodreads website! This entry was posted in Uncategorized on April 7, 2014 by sallystap.